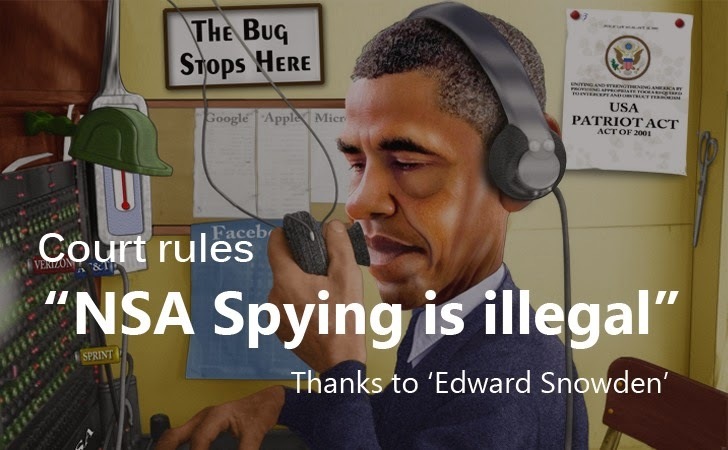 United States’ National Security Agency (NSA) Spying program that systematically collects data about Millions of Americans' phone calls in bulk is illegal – Yes illegal. The NSA Phone surveillance program, first disclosed by the former NSA employee and whistleblower of global surveillance Edward Snowden, ruled illegal by a New York federal appeals court on Thursday, ordering lawmakers to either completely end or replace the program. Under this program, the U.S. agency has collected information about phone numbers called and how many times it has been called. However, no content of conversations has been recorded. The program also allegedly spied on European firms and among the individuals targeted was German Chancellor Angela Merkel. However, the Second U.S. Circuit Court of Appeals in New York issued a 97-page in-depth court ruling, in which all the three judges said that the way NSA collects million of Americans' phone records is illegal. In wake of NSA revelations by Snowden, the American Civil Liberties Union (ACLU) filed its lawsuit in 2013, but in December same year New York District Judge William Pauley dismissed the ACLU lawsuit, saying the NSA program was a government "counter-punch" to terrorism. "For more than seven years, the government has collected the phone records of every American under Section 215 of the Patriot Act, without ever having the justify the program's legality in a public and adversarial court hearing," Brett Max Kaufman, a legal fellow with the ACLU National Security Project, wrote for the ACLU blog after the lawsuit was filed on Nov. 2013. The ruling issued by the court says that a provision of the USA Patriot Act permitting "the Federal Bureau of Investigation (FBI) to collect business records deemed relevant to a counter terrorism investigation cannot be legitimately interpreted to permit the systematic bulk collection of domestic calling records." Section 215 of the Patriot Act legally authorizes the law enforcement to collect "any tangible things" that the government proves are linked or connected to an investigation into any suspected terrorist. However, the latest verdict by U.S. Circuit Court of Appeals now ruled that the mass collection of telephone metadata program run by the NSA – Not Authorized by Section 215 of the Patriot Act. Section 215 "cannot bear the weight the government asks us to assign to it, and that it does not authorize the telephone metadata program," writes Judge Gerard E. Lynch. "Such expansive development of government repositories of formerly private records would be an unprecedented contraction of the privacy expectations of all Americans."